This week we are doing standardized testing at my school. When I was a kid it use to be my favorite week of school. We had no homework, I liked the tests (weird, I know), and it was a break from the normal...but times have changed. Testing week now seems to be a week full of stress and anxiety for the poor kiddos. It stinks! I want the kids to enjoy themselves (as much as humanly possible during testing) and relax. 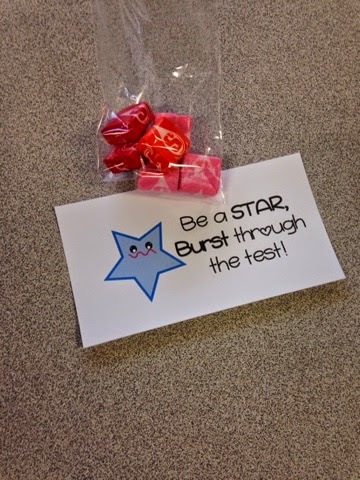 Last year I gave out little motivational treats each morning of testing week for my students. I decided I would do the same this year plus I really like puns. Here is a shot of my week setup of treats. 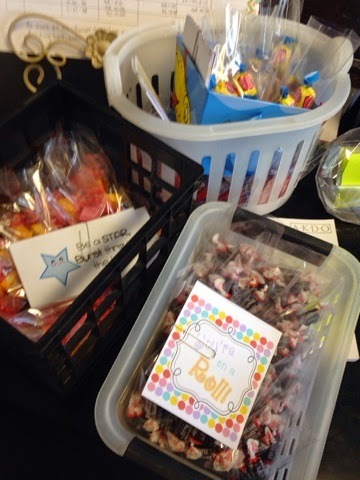 I am giving out Starbursts, Tootsie Rolls, Gum, Swedish Fish, and Smarties with the punny printouts (they are from various places on TPT). I also made up a little testing toolkit for each child. Inside each kit was 2 sharpened number two pencils, an eraser, and a pencil sharpener. The kids love coming in to a new treat each morning. I'm hoping it brightens their week a little bit!